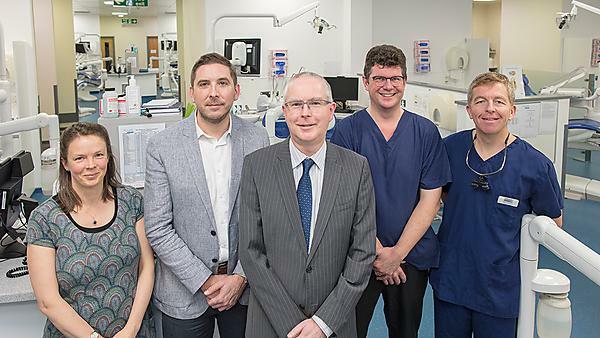 A team from the University of Plymouth Peninsula Dental School has written the second edition of Standards in Dentistry – a flagship publication of the Faculty of General Dental Practice (FGDP(UK)). Led by Professor David Moles, Director of Postgraduate Education and Research, the fully revised and updated book reflects the contemporary clinical, organisational and dento-legal contexts in which dentistry is practised, as well as changes in the evidence base since the first edition was published in 2006. A comprehensive compendium of guidance and standards relevant to primary dental care, the publication sets out specific standards covering consultation and diagnosis, paediatric dentistry, orthodontics, management of acute pain, periodontics, endodontics, removable partial dentures, complete dentures, minor oral surgery, implant dentistry, management of dental trauma, direct, coronal and root surface restorations and indirect coronal restorations. The standards in the new edition are focussed on practitioner processes rather than treatment outcomes, while standards for making and receiving referrals, and for oral medicine, are also included for the first time. Professor Moles worked alongside Ewen McColl, Clinical Associate Professor in Restorative Dentistry; Professor Christopher Tredwin, Head of Peninsula Dental School; Robert Witton, Director of Social Engagement and Community-Based Dentistry; and Lorna Burns, Lecturer in Evidence-Based Healthcare, to compile the book, and its publication follows consultation with a wide range of national dental organisations. “The team at Peninsula Dental School are honoured to have been offered the opportunity by the FGDP to undertake a comprehensive update of the standards in light of changes in the evidence base and in the clinical organisational and the dental-legal context in which dentistry is now practised. We would like to thank all the individuals and organisations that have generously given their time and expertise to comment on the drafts of the second edition. 100 per cent of dental students were satisfied overall with the quality of their course at the University of Plymouth, according to the 2018 National Student Survey.